One fine Sunday morning, I decided to venture out to Lippo Karawaci. Its Benton Junction is quite popular for the cluster of outdoor dining places. 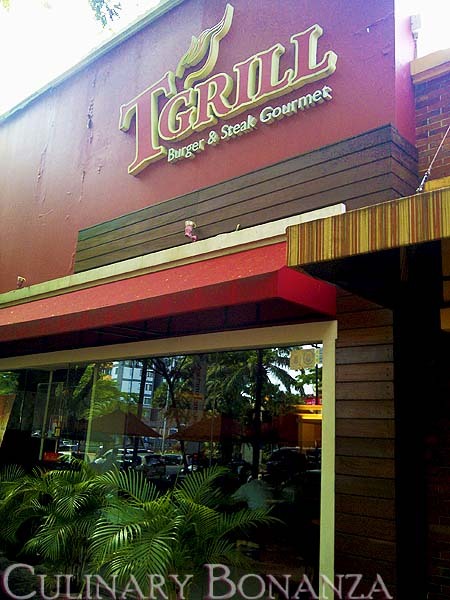 A friend of mine (who's a resident in Karawaci) recommended T Grill in Benton Junction. It is conveniently located right across from the main gate of Universitas Pelita Harapan. I didn't quite know what to expect here, so I was quite pleasantly surprised to find the wide range of food on the menu (too bad the drinks were quite limited & ordinary). There were pastas, sandwiches, burgers, pizzas, steak, rice, and other western style finger food such as calamari, chips, chicken wings, etc. I noticed the Samurai Rice Burger on the menu and I chose that (I've never really liked the bread-buns in conventional burgers). From my past experiences of having rice burgers (I've tried from MOS Burger, Sushi Groove and McDonald's Singapore), they were all exquisite, so I have quite a high expectation for this one. 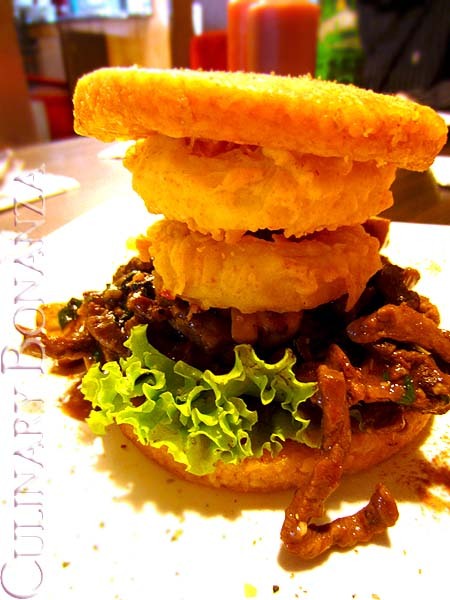 Ooh, sad to say, the rice patty in the Samurai Rice Burger was the worst of all rice burger patties I've ever had so far. =( This item was supposed to have mushroom, beef, onion ring and mushroom sauce, but somehow the other components tasted quite bland, while the only component that I could taste distinctly was the onion ring. Perhaps one consolation was T Grill's affordable price and it seems quite popular, as on my visit, I saw quite a wide variety of patrons, from expatriate families, to students. I shall assume that I was rather unlucky with my choice of food this time round. Would I still consider future visits? Definitely, but I'll make a point to scrap the rice burger off my options. By the way, so happy to finally meet you in person tonight! !